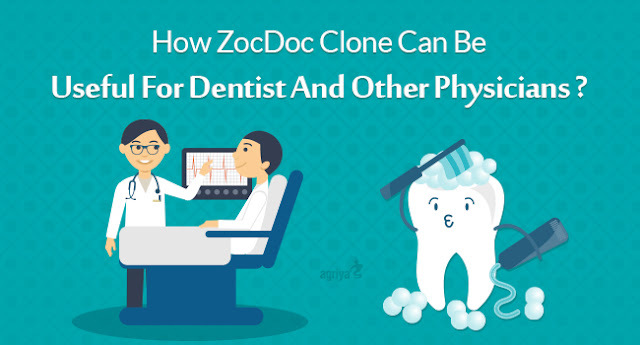 How ZocDoc Clone Can Be Useful For Dentist And Other Physicians ? With a generation that is getting more tech-savvy every passing minute and with unlimited access to smart devices, it is safe to say an online reservation system is a must-have for all service-related ventures. Online reservation or an online appointment booking system plays a vital role in the medical industry where a patient looks for comfort and convenience. Dentists and other physicians are looking for alternatives to phone bookings and direct walk-ins to reduce the scheduling conflicts and to treat patients stress-free. The other side of this scenario, the patients wanted to get treated at a preferred time and by the best physicians. This lead to a creation of many appointment booking softwares and ABS- Zocdoc clone was one of the successful appointment booking script. ZocDoc is an online appointment booking website and app created to ensure the patients to reach out to their preferred physicians at their desired time after reading reviews, ratings etc. The Doctors get listed on ZocDoc based on their specializations. Then they get verified and will be available for patients to treat them based on the scheduled appointment. With an increase in demand for a perfect and functional online appointment booking system, Agriya was able to deliver the best possible solution by creating an excellent ZocDoc clone that was beneficial to patients, physicians and entrepreneurs who wanted to run a successful online appointment booking system. Appointment booking software, the perfect ZocDoc clone was created with features that matched the original and beyond. The responsive design helps in making the site more dynamic and user-friendly. A broader look at the features will explain how dentist can make use of this utility ZocDoc clone script-ABS. The clone script-ABS makes sure patients can book an appointment with a dentist at their preferred time and convenience. The functionality of the site enables appointment booking round-the-clock, which means the patient can log in at any time to make a booking. By getting enrolled the physicians are available to treat more patients during their regular work hours and the chances of “no-shows” are reduced drastically. Doctors using the ZocDoc clone script-ABS doesn’t have to worry about additional expenses in maintaining a resource to take care of all their appointments. Appointment Booking Script, ABS enables dentists and other physicians to have an easy access to the patient's history in a convenient manner. This enables a friction-less treatment from the doctor to the patient. Patient's reviews and ratings on the site determines the probability for doctors to treat more patients. Physicians and dentists can create a unique identity for themselves that offers them both professional and financial success. Benefiting all forms of personnel involved and with versatile features to match the needs of multiple verticals like Lawyers, Counseling, Engineers, Beauticians and many more, the ZocDoc clone script_ABS is a true winner!